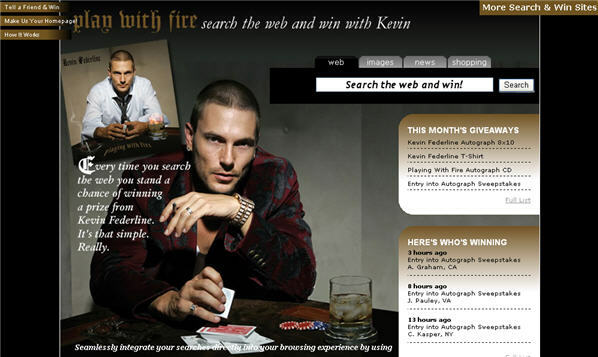 My SearchInsider column last week took exception with K-Fed launching his own search engine. Actually, I take exception with the entire concept of K-Fed that but that’s another point. In today’s SearchInsider, David Berkowitz retorts, rebukes and refutes my negativity around all things Federline, saying that the K-Fed engine shows that search is ubiquitous, search is evolving and search shouldn’t be always all business, no fun. Ultimately he says let the market decide whether a Kevin Federline engine is a good idea or not. Hard to refute that point. Anyway, knowing David, he had a lot of fun writing the column and I certainly had fun writing the original column. The thing that amazes me is that in the past week, 40% of the total ink (or whatever the virtual variation of ink is) on SearchInsider has been devoted to the topic of Kevin Federline. Perhaps someday soon you’ll be able to pick up your local copy of SearchInsider at the grocery checkout and we’ll have great juicy articles about Britney’s rehab and the latest alien that professes to be Elvis, living in Minot, North Dakota. One last point though David. You quoted me as saying that I would rather wear Fiberglas underwear than use the Kevin Federline search engine. That’s not actually true, I would rather wear Fiberglas underwear than attend K-Fed’s birthday party. And you asked where the phrase comes from. For the life of me I can’t remember where I first heard it, but I’m pretty sure it’s not a Canadian thing. I tried to look it up and couldn’t find any references so what the hell, let’s say that I originated the saying. ← Does Online Video Give Us a New User Interface?